MEDIA RELEASE: DRIVE CONFERENCE TO EXPLORE DOMESTIC STRATEGIES IN GLOBAL TECH INDUSTRY. WATERLOO, ON - Navigating the global tech sector has never been more complex; startups need strategies to deal with both domestic and international growth options. DRIVE is Canada's global conference on scaleup ecosystems. In its inaugural year, DRIVE focuses on the question of creating domestic value in a global tech economy. Over two days, DRIVE will bring together thought-leaders from around the globe — policy-makers, researchers, accelerators and successful tech CEOs — to compare best practices and highlight bold ideas. 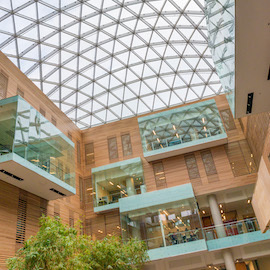 The Lazaridis Institute for the Management of Technology Enterprises at Wilfrid Laurier University, along with Hockeystick, a Toronto data and software provider for the private market, will host this new conference Feb. 20-22, 2019 in Waterloo, ON. The conference kicks off on the afternoon of Wednesday, Feb. 20 with an ecosystem tour, followed by DRIVE-IN, the opening reception. Thursday brings a full day of panels, debates, keynotes, and workshops focusing on specific growth tactics, The day wraps up with a networking reception in Shopify's historic space in downtown Waterloo. The conference continues until lunch on Friday February 22. The full agenda is now live. For more information and ticket details visit www.driveconf.com.